It took me a little while because I went around looking for these guys, got caught on camera then went in search of the recording device to get rid of evidence. Made my way to a colorful apartment where I knocked out someone and swapped out my Italian threads for his Bohemian ones... and then continued my search after making it to the safe house for my silenced sniper rifle and secured the apartment upstairs also. Almost got caught by the bodyguards of the twins as I walked out of the apartment building w/ no idea that they were approach (talk about a "Close One"). I literally tapped the run to get a small gallop to avoid suspicion from them and the guards at the gate on the side of the street I was on. So anyway... I watched them walk and make their way from a shop and over to a seating area, so I ran upstairs and grabbed the sniper rifle (because I couldn't just walk around w/ that thing). After grabbing that, I went up to the apartment I secured previously and used the scope to find them. I wasn't on the balcony, I stood by a sink or stove and took aim from inside to remain out of sight and then saw what I needed to see before a successful head shot was delivered. The target went down on one side of the town and the apartment gave me access from the rooftops to make it out the back way which was nearly effortless. 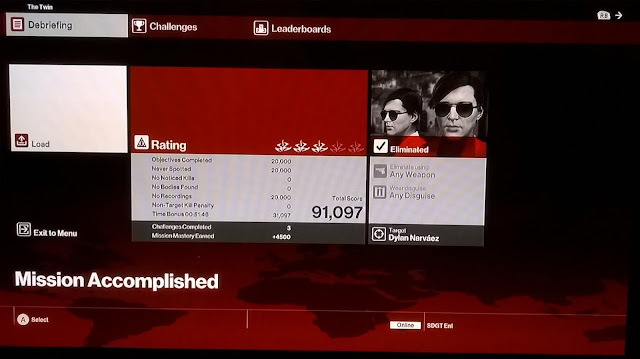 What you see is a pic of my successful elusive target mission of... The Twin. I think this was quite enjoyable, and doing what was necessary to make the right kill... was part of the fun. Anyway, this is Blu... feel free to give this post a +1 if you like my breakdown of my mission... and for more Game News, Reviews and Stuff like this... you're in the right place. Game on!